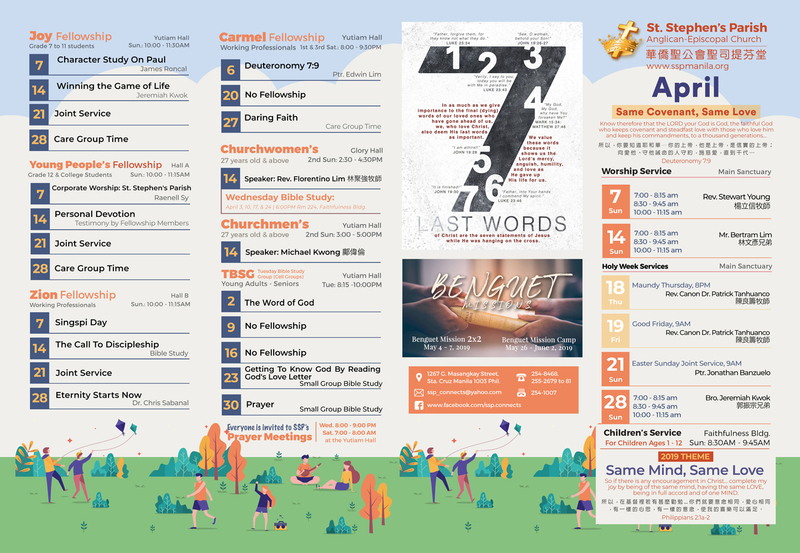 Welcome to St. Stephen's Parish, a Chinese-Filipino, Anglican-Episcopal Church located in the heart of Manila. Please enjoy browsing through our website to get informed, get connected, and get involved. You are most welcome to listen, download, and share the sermons uploaded on our website. You are also welcome to introduce our website to those who are searching for God, those trying to understand the meaning of life, or those who want to know more about believing in Jesus Christ, our Lord and Saviour. If you have questions about St. Stephen's Parish or how to go further in your faith, contact us and we will be happy to help. One with the universal Church of Christ in faith and doctrine. that we are called to be Christ's witnesses to the world and to be servants of one another. to be worshippers in spirit and truth - offering up our lives in its entirety to love, honor and glorify God. To raise up generations of mature followers of Christ to be salt and light in the world who will love God, love others, and make disciples. SSP envisions to impact its community through members who are diligent in making disciples wherever they are, rooted in the Word, reverent in worship, and fervent in prayer. We have joint or combined worship services several times a year. 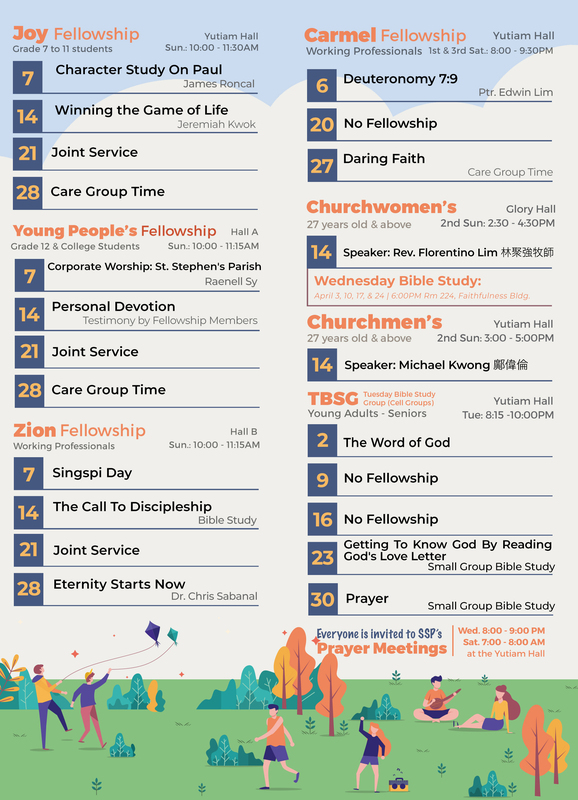 Please refer to our monthly schedule to confirm this month's schedule. Sundays, 8:30 - 9:45 a.m.
Sundays, 10:00 - 11:30 a.m.
Sundays, 10:00 - 11:15 a.m.
2nd Sunday, 2:30 - 4:30 p.m.
2nd Sunday, 3:00 - 5:00 p.m.
Tuesdays, 8:15 - 10:00 p.m.
1st & 3rd Saturdays, 8:00 - 9:30 p.m.
Rev. Justin came to know the Lord at a very young age here in St. Stephen's Parish. Even as a child, he had already been trained and exposed to various ministries in the church such as helping out in Children's Service and in its Children's Choir. Later on, he served in Joy Fellowship as a Bible study leader and counselor and continued to use God-given gifts in whatever capacity they allowed him - from singing in the choir to acting in evangelistic plays or making designs and props for special events and purposes. He first dedicated himself to the fulltime ministry when he was in 4th year high school during their Seniors' Retreat. But the real call came for him when he was at a critical point in his professional career when he had to make a decision on whether or not to enter the seminary or to accept a promotion and an overseas assignment. Struggling with fear and the uncertainty of the future, especially of the kind of life that awaits a pastor, he found comfort and assurance in God's promise that He will be with him every step of the way. 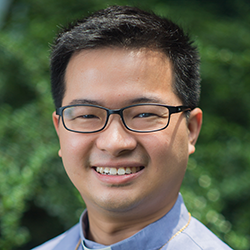 Steadfastly, he resigned from his work and entered the 3-year Master of Divinity in Biblical Studies course at the Biblical Seminary of the Philippines (BSOP), where he graduated recently in March of 2013. Rev. Justin is now the Acting Rector of St. Stephen’s Parish. 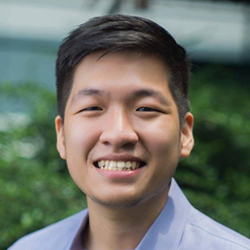 He serves as the chairman of the Worship Committee and also heads the Caregroup Core Committee. He is charged with many other responsibilities whether pastoral, clerical, and administrative. He finds joy in each and every opportunity God gives to serve Him and shepherd His people. His desire is to see through the church’s mission and vision, to gather the church’s leaders to work together with the same mind and same purpose, and most important of all, to be found faithful in God’s eyes. Ptr. Aileen encountered the Lord Jesus during her high school years in Joy Fellowship’s Junior Summer Conference “Survivor”. It was Jesus’ words in John 6:67 that spoke vividly to her “You do not want to leave too, do you?” and was the starting point of a blessed life of following and serving the Lord. She started out as an officer in Joy Fellowship and was also involved in different ministries such as song leading, evangelistic musicals, the choir, and was also a part of the missions team. Her call to the fulltime ministry came in 2006 during a camp “What’s Your Story?” Just like the title of the camp, Ptr. Aileen committed her life’s story and surrendered her future in the hands of the Almighty God. After she graduated from college (BS Management, Ateneo de Manila University), she worked for a year as an operations manager in the commodities distribution arm of CCT (Center for Community Transformation). She then started working as an administrative staff in the church while studying part time as a seminarian. After seven years of both serving as a church staff and finishing a degree, she graduated from the Biblical Seminary of the Philippines with a Master of Divinity in Biblical Studies last May 2017. Ptr. 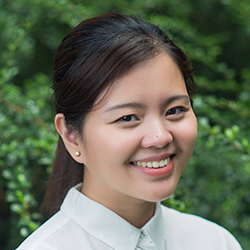 Aileen joined the pastoral team of SSP July of 2017 and is now overseeing the visitation ministry of the church, taking part in Churchwomen’s Fellowship, leading the Fulltimer’s Fellowship, is one of the teachers of the church’s baptismal and confirmation classes, a caregroup leader, a song leader in our Midservice, and continues to serve in various capacities. She hopes to be a supportive wife to Rev. Justin and for their family to be a testament of God’s faithfulness. She also looks forward to training the future leaders of the church to be committed to its mission and vision. Pastor Harold Uy has been part of the SSP pastoral team since May 2015. He is actively involved in shepherding the youth through sports and discipleship. The youth is very close to his heart as Pastor Harold himself came to know the Lord at a young age of 12, when a friend invited him to join SSP's Junior Summer Conference in 2006. It was also during this conference that he committed himself to become a pastor. Through the years, he grew in his faith as he joined St. Stephen's High School (SSHS) and SSP's youth fellowships. When he was 16 years old, he joined the SSP 2 x 2 Benguet Mission Team, where his passion to share the gospel to children and teenagers began. It was through this first mission trip that God further confirmed his calling to be a pastor. Right after finishing high school from SSHS, he enrolled at FEBIAS College of Bible under the program of Bachelor of Arts in Theology, Major in Pastoral Studies. This was a dream come true for him, and his five years of training in the seminary humbled his heart and sharpened his gifts. By God's grace, he graduated Honorable Mention and received the Preaching Proficiency Award in FEBIAS in March 2015. His other ministry involvements are teaching, preaching, and leading SSP's missions and outreaches such as Benguet mission trips and the jail outreach ministry. He also holds Bible studies not only to the youth but also to the church's maintenance staffs and drivers. His desire is to raise up young people who sincerely follow the footsteps of Jesus Christ by being a good example to their families, to the church, and to the society, all for the greater glory of our sovereign God.